Lovely 1 roomed apartment attached to main house, with separate kitchenette. My place is close to Major shopping centers, including N1 City and Canal Walk. 15 - 20 minutes from beach and Table Mountain..., close to the airport, the city center and public transport. 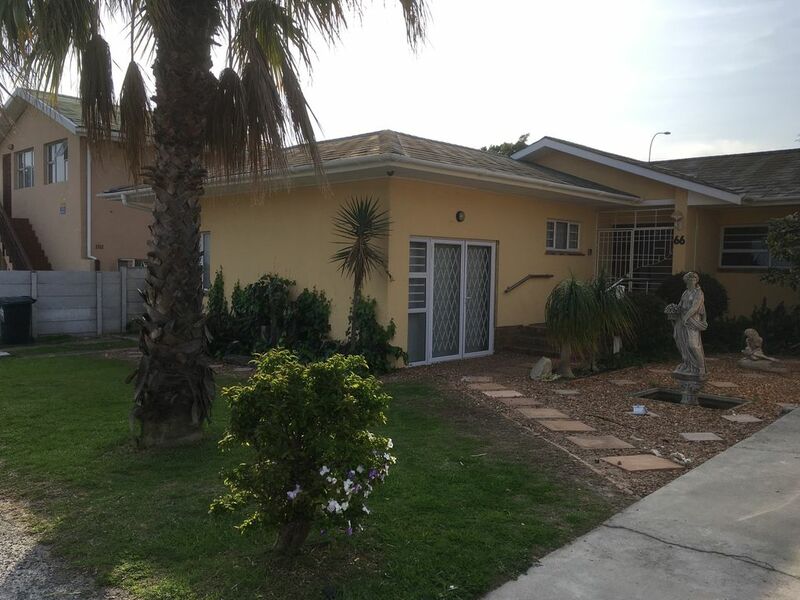 It is situated in a very quiet part in the upper part of the Northern Suburbs of Cape Town. The apartment Is very cozy and has its own kitchen and bathroom. It is well suited for singles, couples and business travelers. The apartment is rather spacious with the room being 12sqm's and kitchen 7.5sqm's, with lovely high ceilings. The apartment is completely private with front and back access points. As the apartment is attached to the main house, it will be impossible to miss each other. We will always be available for guidance and advice when needed. We may even join our guests on an excursion if they like. We are situated in a very quiet and more upmarket part of Cape Town. We have one entrance and exit, thereby having no throughway for traffic and pedestrians. Our suburb has been adopted as "The Little Jewel of The Cape". Unfortunately we are non smokers and the apartment will need to remain smoke free. My wife and I are both 52 years of age, married for 28 years. We are both tee totallers and also non smokers. We are part of the "Freedom fighters" generation, meaning we have lived through and fought the injustices of the past. We both attended high school at Alexander Senior secondary school which was the core of freedom fighting scholars in the 70's, 80's and 90's. Our History is as rich as our beautiful country. The space The apartment is very spacious with the room being 12sqm's and kitchen 7.5sqm's, with lovely high ceilings. Guest access The apartment is completely private with front and back access points. Interaction with guests As the apartment is attached to the main house, it will be impossible to miss each other. We will always be available for guidance and advice when needed. We may even join our guests on an excursion if they like. The neighborhood We are situated in a very quiet and more upmarket part of Cape Town. We have one entrance and exit, thereby having no throughway for traffic and pedestrians. Our suburb has been adopted as "The Little Jewel of The Cape" Getting around We are close to the train station, but very accessible via Uber. In need we also have a vehicle on standby for rental purposes Other things to note Unfortunately we are non smokers and the apartment will need to remain smoke free. Our property is situated in a more upmarket, very quiet and safe part of the Northern Suburbs. It has only one entrance and exit. Our suburb is also known as the Little Jewel of the Cape. The bathroom has a toilet, shower and handbasin, Beautifully tiled. We have a car for rental or of you like. We can also chaufeur you where you need to be or you can use Uber. If you need to rent a vehicle, please bring along your international driving licence, in need.These services are optional extra and needs to be paid on the day in cash. My place is close to Major shopping centers, including N1 City and Canal Walk. 15 - 20 minutes from beach and Table Mountain..., close to the airport, the city center and public transport. You’ll love my place because It is situated in a very quiet part in the Northern Suburbs of Cape Town. The apartment Is very cozy and has its own kitchen and bathroom. It is well suited for singles, couples and business travelers. The space The apartment is very spacious with the room being 12sqm's and kitchen 7.5sqm's, with lovely high ceilings. Guest access The apartment is completely private with front and back access points. Interaction with guests As the apartment is attached to the main house, it will be impossible to miss each other. We will always be available for guidance and advice when needed. We may even join our guests on an excursion if they like. The neighborhood We are situated in a very quiet and more upmarket part of Cape Town. We have one entrance and exit, thereby having no throughway for traffic and pedestrians. Our suburb has been adopted as "The Little Jewel of The Cape" Getting around We are close to the train station, but very accessible via Uber. In need we also have a vehicle on standby for rental purposes Other things to note Unfortunately we are non smokers and the apartment will need to remain smoke free. No pets allowed.